Team Fortress 2 is a multiplayer team-based first-person shooter developed and published by Valve for the PC (via Steam) on October 10, 2007. It was also released as part of The Orange Box (for the Xbox 360, PlayStation 3, and PC), was later re-released as a standalone retail package for the PC (on April 8, 2008), and was later updated for compatibility with Mac (on June 10, 2010) and Linux (on November 6, 2012) on Steam. The Steam version of the game became free-to-play on June 10, 2010. The long-awaited sequel to the original Quake modification "Team Fortress" (and its standalone update, Team Fortress Classic), players join one of two teams (RED and BLU) as one of nine playable classes, each with their own unique traits and assortment of gear, as they fight over a variety of objectives including capturing briefcases, holding onto "control points", and pushing large warheads on rail carts. Unlike the previous installment, Team Fortress 2 sports a cartoony CGI appearance influenced by both mid-twentieth-century Americana and 1960's spytech (after several lengthy development cycles involving realistic modern-military combat and futuristic alien invasions). Certain gameplay mechanics are also more refined, simplifying all class loadouts while removing reliance on grenades and bunny hopping. The Steam version of the game have been receiving numerous post-release updates for almost a decade, adding a large variety of new game modes, maps, weapons, cosmetic items, and gameplay mechanics. It is often used as a testing ground for most of Steam's features (collectively Steamworks) since the game's release, including achievements, cloud saving, item trading, microtransactions, a community marketplace for items, Steam Workshop functionality, free-to-play support, Steam Trading Card support, Steam Play support, and VR headset support. It is also commonly used for cross-promotions and pre-ordering bonuses with other video games, both with special weapons and cosmetic items. The "Team" in Team Fortress 2 is there for a very good reason. From the start, Valve's objective with TF2 was to create a multiplayer shooter where cooperation would always lead to a team that is better than the sum of its parts. A prize too great for one man alone. When it first debuted with the Orange Box in 2007, no deathmatch mode existed in Team Fortress 2. Every map involved holding points, capturing briefcases or, (also new) pushing a Fat Man in a railroad cart into enemy territory. That is because these play styles lend themselves coordination and team progress rather than individual achievement. One man can certainly take all the points or steal the flag, but their job is made extremely difficult by the open layout of the maps and the variety of stalwart defense options the game has to offer against rushing. Instead, pushing the front line or forcing a major breach in the opposition's defenses are the much preferred ways to go about winning a match. Even now that deathmatch has been incorporated (in the form of Arena mode) , most servers have kept their previous map rotations or only added one or two of the new deathmatch based maps and tournament play excludes Arena mode almost entirely. There is no middle-ground in the roster of characters for TF2. The Soldier is usually considered the all-in-one trooper but he is slower than most other classes and is armed with a rocket launcher--a far cry from the universally effective assault rifles of most shooters. There are 9 classes available to both sides during play, and though their secondary weapons may coincide, no two classes have significantly overlapping niches. As a result (usually in combination with circumstance) each class has particular foes they prefer to fight against and particular friends they prefer to work with. The exploitation of class synergy is more than half the battle in TF2; the Heavy may have a boat load of health and a gun to match, but one backstab from the Spy or one headshot from a Sniper will put him down. However, if the Heavy enlists the support of another class, such as a Pyro or Scout, to deal with such menaces the two allies together become far greater adversaries than they would be by their individual merits. Even classes like the Spy, who at first glance seems like a loner, can make an awesome teammate for sabotaging defenses on the way inside enemy territory. The Spy is the second least played class in TF2; the extra difficulty rookie Spies make for themselves by not working in tandem with their allies is at least partially responsible for that. Another way TF2 encourages teamwork is in the respawn system. When players die, they are assigned to a respawn wave rather than simply waiting for an individual timer to hit zero. Aside from the multitude of exploitative tactics that this potentially fixes, the waves also make sure that players remain in contact with each other. This convenience of positioning and exposure increases the chance that players will try to work together when they get back in the field, concerning themselves with a more dedicated push than individual struggles for victory (once again, the class synergies make teamwork a better option nearly always). The effect is really more psychological than it is practical, but it is a conscious effort by the developers to get players to work together. Very few things in TF2 explode. The weapons in the game with splash damage are the Demoman's bombs, the Soldier's rockets, and the Pyro's flamethrower. Other than these, the only thing that blows up are characters that get hit for massive damage. Valve saw the common shooter grenade as a barrier to effective teamwork during the development of Team Fortress. A splash damaging bomb meant the potential for an everyman's weapon, useful against any opponent and effectively leveling the playing field between classes. A breakdown of the rigidly assigned capabilities of the classes would be detrimental to the teamwork aspect. The other major issue Valve saw in using grenades was one that crops up in many shooters (CounterStrike being a home turf example for Valve) where grenades are spammed with reckless abandon during matches with the hope of landing a kill on that one unfortunate soul that doesn't know what is going on. Curbing exploitation of new, inexperienced players and enhancing team cohesion were both strikes against grenades, so Valve took them out. They have been criticized by the community ever since for doing so; some avid modders have even developed grenades for use in TF2, though these mods have caught only minimal popularity amongst players. Considered the game's "twitch" class, the Scout is commonly used for quick hit-and-run tactics against vulnerable opponents due to his very fast movement, thin physique, ability to jump while in mid-air, and powerful close-ranged shotgun (known as the Scattergun). However, due to his low amount of health (tied for the lowest with the Engineer, Sniper, and Spy), he is weak against groups of enemies and general front-line combat. His primary weapon, the Scattergun, is a short double-barreled shotgun identical in function to the standard Shotgun used by the Soldier, Pyro, Heavy, and Engineer. However, it is deadlier at close ranges. He can also use the standard Pistol as a backup weapon (preferably for longer ranges) and a metallic baseball bat for melee combat (which sacrifices damage dealt for faster swings). While the Scout is generally used for combat, he also has a big supportive role in capturing objectives. His agility allows him to navigate the battlefield quickly and easily (especially when carrying an enemy briefcase or initiating an objective capture). He also counts as two players when capturing an objective, allowing for quicker captures if a low amount of teammates are around. One of the easiest classes to start with, the Soldier focuses on general-purpose combat with his trusty rocket launcher (capable of taking down enemies quickly with powerful explosions, especially in tight groups). He can also catapult himself a great height (at the cost of a good chunk of his health) by performing a "rocket jump" (an advanced technique where the player aims at the ground beneath the Soldier and fires the Rocket Launcher while jumping). Although he is the second slowest mercenary in the game, he has the second highest vitality. His primary weapon, the Rocket Launcher, fires powerful rockets in a straight line (unaffected by gravity, unlike the Demoman's Grenade Launcher) and has both a large knockback effect and decent splash damage (especially when aimed at the feet of enemies). Although rockets are less effective at longer ranges, it is one of the biggest beneficiaries of Critical Hits (as one critical rocket can take out most full-health classes in a single explosion, at any range). He also carries a backup Shotgun and trench shovel, both for use when he runs out of rockets (or is not in a position to reload the Rocket Launcher). Some of the items added later in the Steam version replaces his backup Shotgun with a special backpack that gives the Soldier a more supportive role in the game. As he deals damage over time, his Rage meter fills. Once the meter fills up, he can activate the Banner on his backpack to give himself and nearby teammates a specific buff (either offensively or defensively). The least comprehensible class (thanks to the gas mask), the Pyro excels in simple close-range ambushes thanks to the Pyro's homemade flamethrower (allowing them to deal continuous fire damage with ease). Due of the simplicity of the flamethrower and the Pyro's good vitality (tied for third-highest in the game with the Demoman), the Pyro can cause panic among tight-knit groups of enemies. The Pyro's primary weapon, the Flame Thrower, fires a constant stream that ignites enemies at close ranges. Continuously firing on enemies, especially at very close range, can quickly finish them off. While ignited, enemy players slowly lose health for a short amount of time (or until they are either extinguished with water or healed through a medkit), known as "afterburn damage". Other Pyroes, wearing flame-retardant suits, are immune to afterburn damage. Because the Flame Thrower runs out of ammo quickly (and cannot ignite enemies underwater), the Pyro also carries a backup Shotgun (for longer ranges) and fire axe (for closer ranges). Although generally an ambush character, the Pyro also serves as a utility class as the Flame Thrower can ignite both disguised and cloaked Spies (making them the perfect "Spy checking" class). A year later, the Steam version gave the Pyro the ability to perform a blast with the Flame Thrower's air tank (known as the "Compression Blast"). Although compression blasts (done with the Alternate Fire button) eat up a chunk of the Flame Thrower ammo, their deflective and extinguishing capabilities adds a variety of both offensive and defensive tactics. Enemy projectiles can be deflected back (making them harmless to teammates and harmful to enemies), enemies themselves (even disguised and cloak Spies) can be pushed/juggled, and ignited teammates can be extinguished. Some of the melee weapons added later in the Steam version allows the Pyro to remove enemy Sappers from friendly Engineer Buildings. The master of explosives, the Demoman excels at indirect destruction with timed grenades from his standard grenade launcher and remotely-detonated "stickybombs" from his special Stickybomb Launcher. While he is tied for the third-highest vitality (with the Pyro), direct combat with his explosive weapons can be difficult for beginners (sometimes putting him in the position of relying on his whiskey bottle as a melee weapon). His primary weapon, the Grenade Launcher, fires grenades that bounce off surfaces and detonate after a short amount of time. If the grenade hits an enemy player or enemy Engineer Building before hitting a surface, it detonates automatically (dealing more damage). It is the only weapon in the game that can be used efficiently from behind corners. His secondary weapon, the Stickybomb Launcher, fires adhesive grenades that stick onto most surfaces (the main exceptions being doors, players, or Engineer Buildings). Primarily used in groups both for traps and for taking out nests of enemies (including Engineer Buildings), he can lay up to eight stickybombs out before detonating them all at once (from anywhere, wielding any weapon, with the Alternate Fire button). If he lays more than eight, the first one breaks apart harmlessly. Stickybombs can also break apart harmlessly if they are either fired upon by enemy bullets or if the Demoman dies. Like the Soldier, the Demoman can use stickybombs to reach great heights and distances through "sticky jumping" (an advanced technique where the player detonates 1-2 stickybombs underneath the Demoman while jumping). Some of the items added later in the Steam version adds optional offensive melee-centric functionality for the Demoman (coined "Demoknight"). Instead of a Stickybomb Launcher, the Demoman can passively equip a shield that increases damage resistance. Pressing the Alternate Fire button while the Charge meter is full (which is filled up automatically over time) allows the Demoman to charge forward at high speed (adding a temporary crit buff at a certain point in the charge, perfect for melee swings). The Demoman can also trade his Grenade Launcher for special Boots that further increase his capability as a Demoknight. The largest mercenary in the game, the Heavy sacrifices his movement speed for both very high vitality (with double the HP of half the roster) and the biggest (and arguably most powerful) weapon in the game: a large gatling gun. Like the Soldier, he is one of the easiest classes to start with. His primary weapon, the Minigun, has a high rate of fire and is able to quickly rip through enemies at close range. However, he must spin up the gun before firing and spin down the gun after firing (both taking a few seconds to perform and giving an audio cue to nearby enemies). Holding down the Alternate Fire button spins up the gun without firing (allowing him to be prepared for the right time to fire). When the gun is spinning/firing, the Heavy cannot jump or switch weapons and his movement speed is reduced by nearly half. Crouched Heavies cannot move their position at all while spinning/firing. The Minigun deals less damage against upgraded enemy Sentry Guns. If the Heavy runs out of ammo (or is in a position where spinning up the Minigun is not a good idea), he has a backup Shotgun (for longer ranges) and his fists (for closer ranges). Some of the items added later in the Steam version replaces his backup Shotgun with food that can increase his survivability outside of fights. Pressing either the Fire button or performing a basic taunt eats the food (either restoring his health or giving him a special buff) while pressing the Alternate Fire button allows him to drop the food as a medkit for a nearby teammate. A stationary automated turret (known as the Sentry Gun) that turns and fires at all enemies in range (with the exception of cloaked and disguised Spies) with its single-barrel machine gun. It can be upgraded twice, once replacing the machine gun with dual gatling guns and once adding a quad-barreled missile launcher on top. Upgraded Sentry Guns also have more "health" and more resistance to the Heavy's Minigun. Despite having great knockback power, Sentry Guns can not perform Critical Hits. A portable resupply locker (known as the Dispenser) that slowly provides an endless source of health and ammo to nearby teammates. A later update for the Steam version allows the Engineer to upgrade the Dispenser twice, increasing both "health" and dispensing efficiency. Two Teleporter nodes (a Teleporter Entrance and a Teleporter Exit) that quickly bring a teammate from one area to the other (before recharging). Players can get "telefragged" by enemies by standing on the Exit node as they teleport. Teammates cannot teleport while holding the Intelligence. A later update for the Steam version allows the Engineer to upgrade both nodes simultaneously twice, increasing both "health" and recharge time. He can construct each building using a special PDA device, which allows him to place the device in any position and direction for automated construction. He can speed up construction by hitting it with his melee weapon (the Wrench). He cannot build more than one Sentry Gun, Dispenser, and set of Teleporters at a time. He can, though, automatically self-destruct each device (unless it is sapped by an enemy Sapper) using another special PDA device, giving ammo to players that run over its pieces. Repairing, restocking ammo (for the Sentry Gun) and upgrading his gadgets is done by constantly hitting them with his Wrench, applying a special type of ammo (Metal) to it. Metal is collected in the same fashion as normal ammo. Both Teleporter nodes are repaired and upgraded simultaneously when the Engineer hits either one with his Wrench. Along with a variety of gunfire, enemy Spies can disable Engineer buildings by placing Sappers directly onto it. After the "health" of the building is slowly sapped away, the building self-destructs. The Engineer's wrench can be used to remove Sappers. Sappers placed/removed on one Teleporter node will automatically place/remove them on the other. The Steam version, after a few years, added the ability for the Engineer to "pack up" his buildings (using the Alternate Fire button) and move around with them (before placing them in a new location). He can only haul one building at a time, at which he cannot switch to a weapon and has a slower movement speed. Two of the major gameplay-changing items added later in the Steam version include the Wrangler (a Pistol replacement enabling the Engineer to have manual control over the Sentry Gun) and the Gunslinger (a special melee weapon allowing the Engineer to quickly build a small Mini-Sentry Gun instead of a regular one that cannot be upgraded). One of the weakest offensive combatants in the game (carrying both a bonesaw and a fully-automatic air-powered gun that fires syringes), the Medic instead specializes in directly healing his teammates in the front-lines with his special medical gadget: the Medi Gun. The Medi Gun emits a beam that automatically attaches to the player's chosen teammate (including enemy spies that are disguised), allowing him to move around and observe the battlefield. The beam heals the teammate it is attached to and buffs their health beyond their maximum capacity (150% of its normal value, known as "overhealing"). Players who request help from a Medic have an indicator on top of them, which only the Medic can see. While the Medic cannot use the Medi Gun on himself, he automatically regenerates a small portion of health every second. As his Medi Gun heals teammates, the Medic's "Übercharge" gauge slowly charges. Once it is fully charged, the Medic can choose to activate an Übercharge, granting himself and his teammate 8 seconds of full invulnearability. Later updates in the Steam version added new types of Medi Guns that adds new Über effects (replacing the invulnerability with either guaranteed Critical Hits, more optimal healing, or resistance to both Critical Hits and certain damage types). The only class to focus on long-ranged marksmanship, the Sniper is used behind the front-lines to snipe at individual enemy targets using his bolt-action sniper rifle. Because of his fragility, the Sniper usually does not fare well in direct combat (despite carrying both a fully-automatic backup submachine gun and a Kukri machete). His primary weapon, the Sniper Rifle, is most effective when zoomed in (using the Alternate Fire button). The longer the scope is zoomed in, the more powerful the next shot becomes (as long as he does not zoom out). While zoomed in, he has limited manueverability and a limited field of view. While there are no random critical hits for shots below the head, headshots have a special Critical Hit buff that can automatically kill most enemies in a single shot (especially with a high zoom charge). Two of the major gameplay-changing items added later in the Steam version include the Huntsman (a bow-and-arrow replacement for the Sniper Rifle allowing more medium-ranged combat) and the Jarate (replacing his backup submachine gun with a regenerating jar of urine, allowing him to extinguish teammates, debuff enemies, and nullify Spy cloaks). As the game's sole stealth class, the Spy focuses on infiltrating enemy lines with a unique assortment of spytech gadgets (allowing him to render himself invisible and disguise as an enemy player) in order to assassinate enemy targets and disable enemy Engineer gadgets. Because of his fragility, he is considered difficult to learn (especially against a coordinated team). A Disguise Kit, which allows him to disguise himself as a player on the enemy team in a chosen class. This prevents enemy players from drawing their attention towards him (as long as he doen't act in a suspicious manner). Firing his Revolver or using his Knife removes the disguise automatically. Enemies can identify a disguised Spy by his lack of weapon firing, collision with his "allies", taking damage from his "teammates", and being marked/ignited by a "friendly". He can also disguise himself as a player on his own team, confusing his enemies for a short time. An Invisibility Watch, which allows him to cloak himself for nine seconds (or until he manually decloaks). His cloak meter, which tracks how much cloak he has remaining, is either refilled from ammo sources or slowly over time (while not cloaked). If a cloaked Spy takes any damage, or bumps into an enemy player, the cloaked Spy becomes slightly noticable to any players that see him. Cloaked Spies who are marked/ignited are more noticable to enemy players. A later update in the Steam version added two new types of Invisibility Watches: "Cloak and Dagger" (a motion-sensitive cloaking device in which the Spy can cloak himself indefinitely, provided he doesn't move constantly) and "Dead Ringer" (a unique cloaking device where the Spy can feign death, dropping a fake corpse and immediately becoming completely cloaked for a short time). The Spy has also received numerous Knife types, the most prominent of which replaces use of the Disguise Kit with silent kills (allowing him to instantly disguise as his victim while making it appear as if the victim didn't really get backstabbed). All Control Point modes involve the objective of controlling designated "control points" scattered throughout the level. Unlocked control points are captured by standing right on top of them (unless the player is disguised, cloaked, or invulnerable) uncontested (in which no enemy players are next to it, unless they are disguised, cloaked, or under the effects of Bonk! Atomic Punch) after a certain period of time. Multiple teammates, Scouts, and players with certain items capture points faster (up to a limit). Locked control points can not be captured. The standard, and most common, type of Control Point has a symmetrical five-point layout, where both teams start with two points captured (and locked) and one neutral unlocked point to fight over. Players win the round once their team captures all control points in a set order. Spawn areas can change depending on the current unlocked control points. Attack/Defend - An asymmetric variation of Control Point where the RED team initially controls all three control points and must defend them, in set order, against the BLU team. RED wins if at least one of their points are uncontested at when the timer reaches zero, while BLU wins if they take control of all points. RED cannot recapture points at any time. The most common variations of Attack/Defend adds multiple stages (separating groups of control points by rounds) and a "pyramid"-style control point layout (allowing BLU to attempt to capture the first two points simultaneously before the final point is unlocked). Arena - Added in the August 19, 2008 update. Players fight each other in full-out team deathmatch with no respawning and a disabled neutral control point in the center of the level. If members of both teams are alive after a minute, the point becomes available for capture. Rounds end once either the point is captured or a team is fully eliminated. Health kits are rare (forcing players to rely on Medics and Dispensers). The first player to earn a kill gets a five-second crit boost (known as "First Blood"). Some players are forced to sit a round out if the teams are unbalanced. King of the Hill - Added in the August 13, 2009 update. Players fight each other over a single neutral control point in the center of the level. The control point is locked for a short amount of time at the beginning of the round. Teams have a three-minute countdown clock (seven for Ghost Fort), which can only count down if they control the point. If the team's countdown clock reaches zero and the other team is capturing the point, their clock is put into "Overtime" (which they can only win by fully reversing the capture or recapturing it). Rounds end once a team's countdown clock reaches zero with no "Overtime". In the traditional symmetrical Capture the Flag mode, players must attempt to steal the enemy's intelligence briefcase in the enemy base (while preventing the other team from doing the same in their base) and bring it back to their "Intelligence Room". The first team to reach the capture limit (or the team with the most captures when the timer reaches zero) wins the round. Players carrying Intelligence cannot use Teleporters, cannot be invulnerable, cannot be cloaked or disguised, cannot enter a resupply area with it, and cannot use the Rocket Jumper or Sticky Jumper weapons. They can, however, drop the Intelligence manually. Dropped Intelligence (either manually or through death) are automatically returned after one minute (or, if in a deadly hazard, returned automatically). Mannpower - Added for early beta access in the December 22, 2014 update (and made official on the October 28, 2015 update). Same as normal Capture the Flag, only with the addition of a Grappling Hook action item, multiple powerups scattered throughout the map, and traditional CTF flag scoring (in which the Intelligence must be returned prior to capturing). Dropped flags return after a small timeout window (which does not refresh until its returned or captured). Other than Uber (which provides an ÜberCharge for 35 seconds) and Critical Hit (which provides crits for 30 seconds), players can only pick up and store one powerup at a time (which is dropped on death). Agility - Increased movement speed, jump height, grapple speed and weapon switch speed. Haste - Double firing speed, reload rate, clip size, and max ammo count. Increased movement speed. King - Increased max HP, firing speed, and reload rate. Regenerates health. All effects apply to nearby teammates. Knockout - Restricts to melee and grappling hook. Increased max health and damage (4x damage to buildings). Melee hits knock victims away and drops their carried flags. Immune to pushback. Plague - Touching an enemy gives them and their teammates the "plague", which make them bleed to death in 10 seconds unless they replenish health (through a health kit or regen cabinet). Precision - Reduced bullet spread. Immune to distance damage falloff. Sniper rifles have quicker re-zoom and deal double damage. Blast weapons have a higher clip size and faster projectile speed. Reflect - Half of incoming damage is reflected back to the attacker (all damage if the attacker is a Sentry Gun). Increased damage resistance and max HP. Regeneration - Regenerates ammo, health, and metal. Resistance - Halves incoming damage. Strength - Double damage. Immune to distance damage falloff. Supernova - Using the grappling hook's secondary fire, discharge a blast that stuns nearby enemies (pushing them away while dropping their powerups). One time use. Vampire - All damage dealt is returned as health. Increased damage resistance and max HP. Added in the April 29, 2008 update. Payload is an asymmetrical game mode (similar to Attack/Defend) in which the BLU team must "push" a warhead on a rail cart on a set path towards RED team's base. Carts are pushed by standing next to it (unless the BLU player is disguised, cloaked, or invulnerable) uncontested (in which no RED players are next to it, unless they are disguised, cloaked, or under the effects of Bonk! Atomic Punch). Multiple teammates, Scouts, and players with certain items capture points faster (up to a limit). Carts also act like a Dispenser, giving health, ammo, and metal to those who are pushing it. On specially marked slopes in the HUD, carts that are contested or unattended quickly roll down backwards. Carts left unattended after a certain amount of time begin to roll backwards slowly towards the last checkpoint. As the BLU team pushes a cart towards a checkpoint, the spawn areas for both teams can change. The BLU team wins the round if they reach the final "terminus" (causing a giant explosion if it's a single-stage level or the final stage of a multi-stage level), while the RED team wins the round if the timer reaches zero and the cart is unattended. Like Attack/Defend, a common variation splits the level into multiple "stages" (separating groups of checkpoints by rounds). Single-stage layouts usually have three checkpoints (followed by the terminus) while three-stage layouts usually have two checkpoints each (followed by the terminus in the last stage). Payload Race - Added in the May 21, 2009 update. A symmetrical version of Payload, each team has their own dedicated cart and must push theirs while preventing the other team from doing the same. The first team to reach the final "terminus" first wins. Carts can not slowly roll backwards, and there are no checkpoints. Levels may be split into multiple checkpoint "stages" (with wins in the early stages giving a slight advantage to the final stage). Since the game's release date, Valve has introduced (in rare occassion) game modes that are used only for one or two maps. Information about these modes can be found with their respective maps below. A cooperative horde mode where the Red and Blu teams unite to fight off waves of robots produced by Gray Gravel Co. Hundreds of robots resembling the 9 classes carry a bomb towards a point at one end of the map. If the bomb reaches the point it explodes and players must restart the wave. Robots drop cash when killed that players use to upgrade their equipment. Soldier Training - Players are instructed basic movement and then the Soldier's basic weapons against both wooden targets and live targets. Afterwards, players are transported to a special version of Dustbowl, where they are instructed on both the rules of the Capture Point game mode and the functionality of some of the special classes. Demoman Training - Players are instructed about special situations with the Demoman's basic weapons (including stickybomb detonation ranges). Spy Training - Players are instructed on the Spy's special functions (cloaking, disguises, sapping, and backstabbing). Engineer Training - Players are instructed on each of the Engineer's buildings and special functions (building, upgrading, hauling, destroying). Afterwards, players can play Offline Practice against a variety of A.I. opponents in certain maps and game modes. Stats and achievements are disabled. While the initial version of the game only included six maps (each in their original game mode), the Steam version added dozens of new maps (both by Valve and by members of the game's mapping community). Most of these maps are still active in the their respective game mode playlist. Each map usually carry the same theme: agricultural or industrial facilities (both rustic and abandoned, usually with a RED or BLU company owning them) with secret spytech bases and equipment. 2Fort (CTF) - Based on the oldest (and one of the most iconic) maps in the Team Fortress franchise, 2Fort has two almost-identical agricultural facilities (with secret bases deep in their basements) separated by a bridge over a stream of water (with an alternate path underneath). Because of the long passages between the entrance of each "fort" and the Intelligence, this is one of the easiest CTF maps to defend on. Dustbowl (A&D) - Based on the Team Fortress Classic map of the same name, Dustbowl is a three-stage Attack/Defend map (with two control points each) set in a large RED facility in the desert (as BLU makes their way towards a large rocket at the center of the facility). It was later used in Training Mode. Granary (CP / Arena) - Set in a large agricultural facility. A special Arena version was released on August 19, 2008 as one of five maps to introduce the gamemode, focusing on the center control point (moving the spawn areas closer to each team's second point). Gravel Pit (A&D) - A single-stage Attack/Defend map with a "pyramid"-style control point layout as BLU tries to control two control points (Radio Tower and Radar) in any order before attempting to capture the last control point (Laser Gun) on the top of a tall tower. Hydro - The only official map using the Territorial Control (TC) game mode, Hydro is a very large industrial hydroelectric power plant split up into six "territories". Teams start with three territories each (two "main" territories and one "base" territory) and must attempt to control every main territory (Radar Dish, Power Plant, Dam, and Warehouse) through multiple two-point Control Point rounds (set on sectioned-off areas of the map, with one point representing a territory). Rounds end once a team captures the other control point or eliminates the other team in Sudden Death (both cases giving them the territory). Once a team captures all four main territories, they must attempt to capture the other team's base territory in an Attack/Defend scenario to win the game. If the defending team maintains their point when the game's timer reaches zero, they are given one of their territories back. Well (CP / CTF / Arena) - Based on the Team Fortress Classic map of the same name, Well has two almost-identical industrial facilities (with secret bases in the far ends of each facility) separated by a trainyard. This map is the first to have deadly instant-kill hazards (high-speed trains that travel through the two middle tracks in the neutral building). The map later received a CTF version (on January 25, 2008 as the first official post-release map) and an Arena version (on August 19, 2008, introduced with the gamemode). The CTF version replaces the neutral building in the center with a smaller shed (and one track instead of two), while the Arena version focuses solely on the trainyard. Badlands (CP / Arena / KOTH) - Added on February 14, 2008, Badlands is a desert-themed map based on the Team Fortress Classic map of the same name. The map later received an Arena version (on August 19, 2008, introduced with the gamemode) and a King of the Hill version (on April 14, 2011, the Hatless Update), both focused on the center control point. Gold Rush (PL) - Added on April 29, 2008 (Gold Rush Update), Gold Rush introduced the Payload game mode and its three-stage layout. Badwater Basin (PL) - Added on August 19, 2008 (Heavy Update), Badwater Basin introduces the single-stage layout. Lumberyard (Arena) - Added on August 19, 2008 (Heavy Update), Lumberyard is one of the five maps to introduce the Arena gamemode. Ravine (Arena) - Added on August 19, 2008 (Heavy Update), Ravine is one of the five maps to introduce the Arena gamemode. Nucleus (Arena / KOTH) - Added on May 21, 2009 (Sniper Vs. Spy Update). It later received a KOTH version (on August 13, 2009, introduced with the gamemode). Pipeline (PLR) - Added on May 21, 2009 (Sniper Vs. Spy Update), Pipeline introduced the Payload Race game mode and its three-stage layout. It is also the first official map to take place at night. Sawmill (Arena / CTF / KOTH) - Added on May 21, 2009 (Sniper Vs. Spy Update). The map later received both a CTF version (on August 13, 2009) and a KOTH version (on August 13, 2009, introduced with the gamemode). Viaduct (KOTH) - Added on August 13, 2009 (Classless Update), Viaduct is one of the three maps to introduce the King of the Hill gamemode. Double Cross (CTF) - Added on December 17, 2009 (WAR! Update). Gorge (A&D / CP / MP CTF) - Added on December 17, 2009 (WAR! Update). It later received a standard Control Point version (on January 19, 2011, known as "5Gorge") and was one of the first maps used to test Mannpower CTF (on December 22, 2014, using the 5Gorge version), which was officially released with the game mode. Hightower (PLR) - Added on July 8, 2010 (Engineer Update), Hightower has a single-stage layout with both carts' paths ending with platforms known as "hightowers". Each hightower requires a player on the same team to stand on it for it to slowly rise. If nobody is capturing the hightower, it drops back down. Once the hightower rises to the top (and the other hightower is not being captured), the cart detonates. Thunder Mountain (PL / MP CTF) - Added on July 8, 2010 (Engineer Update). Uses the three-stage layout. The first stage was later used for Mannpower CTF testing (on March 12, 2015) and was officially released with the game mode. Upward (PL) - Added on July 8, 2010 (Engineer Update). Uses the single-stage layout. DeGroot Keep (A&D) - Added on December 17, 2010 (Australium Christmas), DeGroot Keep is a single-stage Attack/Defend map with a unique "pyramid"-style control point layout set in the front of a keep in an old-fashioned town. BLU must capture two control points (in any order) outside of the keep before the gate opens and the final point is made accessible. If the final point is uncontested after one minute, the gate closes and the first two points must be captured again. As the only official map using the Medieval Mode settings, players have a restricted loadout (allowing only melee weapons, bow-based weaponry, and some special secondary gear), drop small health kits on death, can enable third-person perspective without requiring cheats, and have special text chat rules (making it resemble "Ye Olde" English). Barnblitz (PL) - Added on June 23, 2011 (Über Update). Uses the single-stage layout. Foundry (CP / MP CTF) - Added on December 15, 2011 (Australium Christmas 2011). It was later used as one of the first maps to test Mannpower CTF (on December 22, 2014) and was officially released with the game mode. Doomsday - Added on June 27, 2012 (Pyromania Update), Doomsday is the only official map (other than its Halloween equivilent) using the Special Delivery (SD) game mode, as players must pick up a neutral flag (an "Australium" briefcase spawned on one side of the map's center) for their team and bring it to the launch pad of a large space rocket (located on the other side of the map's center). As long as the player with the Australium stays on the launch pad, the pad slowly rises to the top of the rocket (similar to "hightowers" in Hightower). The team wins once the launch pad is fully risen and the player puts the Australium case in the top of the rocket (launching it up into space, maybe). Players on the opposing team must kill the Australium carrier and let the Australium return back to its initial point (so they can have a chance at grabbing it). Asteroid - Added on July 8, 2014 (in beta form), Asteroid is the only official map using the Robot Destruction (RD) game mode and is located on two opposing space bases located on an asteroid. Players collect Power Cores by destroying defenseless enemy robots located throughout the enemy base to automatically power their team's Reactor. Players can only damage enemy robots in Area B if all enemy robots in Area A are destroyed (and likewise for Area C with Area B robots). Robots regenerate after a short period of time. Players can also sneak back to the far side of the enemy base and steal the enemy Reactor Core (waiting as enemy points are deposited to the Core, leaving them open for enemy defenses) and attempt to capture it. The team that reaches a certain amount of points first (although a countdown allows enemy players to steal a Core) wins the round. This map is currently unfinished. Cactus Canyon (PL) - Added on July 8, 2014 as an introduction to the Mann Co. Beta Maps program, Cactus Canyon is a two-stage desert-themed Payload map where the BLU team must guide their payload cart to a set of train tracks (in which one of the passing trains must collide with it to detonate). This map is currently unfinished. Powerhouse (CP) - Added on July 2, 2015 (Gun Mettle Update), Powerhouse is located on a small symmetric hydroelectric power plant. Unlike all previous Control Point maps, this map is more densely-packed and only uses three control points. Brickyard (PT) - Added on August 18, 2015 (in beta form), Brickyard (previously known as Warehouse) introduced the PASS Time game mode, in which players must pick up the Jack (an explosive ball dropped at the center of the map) and throw it in the enemy goal. While carrying the ball, the player receives health regeneration, a temporary speed increase, and the ability to see teammates and enemies through walls. Players cannot attack while holding the Jack and can only throw it (either by lobbing it or by "passing" it by looking at a teammate and "locking" on to them). Players can also "steal" the Jack from enemies using melee attacks. It was officially released on the Meet Your Match update with the game mode. Hellfire (MP CTF) - Added on October 28, 2015 to introduce the Mannpower CTF game mode. District (PT) - Added on July 7, 2016 (Meet Your Maker Update) to introduce the PASS Time game mode. Timberlodge (PT) - Added on July 7, 2016 (Meet Your Maker Update) to introduce the PASS Time game mode. Mercenary Park (CP) - Added on October 20, 2017 (Jungle Inferno Update). Turbine (CTF) - Added on June 19, 2008 (Pyro Update). Fastlane (CP) - Added on June 19, 2008 (Pyro Update). Steel (A&D) - Added on August 19, 2008 (Heavy Update), Steel is a single-stage Attack/Defend map with five points. Unlike other Attack/Defend maps, the BLU team can attempt to capture the final point (Point E) early to win the game automatically. Capturing each of the four other points give a benefit to BLU (opening up additional paths, restricting RED's spawn, and extending bridges to Point E). Egypt (A&D) - Added on February 24, 2009 (Scout Update). Junction (A&D) - Added on February 24, 2009 (Scout Update). Watchtower (Arena) - Added on February 24, 2009 (Scout Update). Hoodoo (PL) - Added on May 21, 2009 (Sniper Vs. Spy Update). Offblast (Arena) - Added on August 13, 2009 (Classless Update). Yukon (CP) - Added on August 13, 2009 (Classless Update). Harvest (KOTH) - Added on October 29, 2009 (Haunted Hallowe'en Special). Freight (CP) - Added on April 28, 2010. Coldfront (CP) - Added on July 8, 2010 (Engineer Update). Mountain Lab (A&D) - Added on October 27, 2010 (Scream Fortress). Frontier (PL) - Added on February 24, 2011 (Community Map Pack). Lakeside (KOTH) - Added on February 24, 2011 (Community Map Pack). Nightfall (PLR) - Added on February 24, 2011 (Community Map Pack). Gullywash (CP) - Added on October 13, 2011 (Manniversary Update). Kong King (KOTH) - Added on August 10, 2012. Process (CP) - Added on July 10, 2013 (Summer Event 2013). Standin (CP) - Added on July 10, 2013 (Summer Event 2013), Standin is unique in that all three capture points are neutral from the start and can be captured at any time. The team with all three points captured and uncontested wins the round. Snakewater (CP) - Added on November 21, 2013 (Two Cities Update). Borneo (PL) - Added on July 2, 2015 (Gun Mettle Update). Snowplow (A&D) - Added on July 2, 2015 (Gun Mettle Update). Suijin (KOTH) - Added on July 2, 2015 (Gun Mettle Update). 2Fort Invasion (CTF) - Added on October 6, 2015 (Invasion Update). A special themed version of 2Fort, set at night, in which the two forts are converted into makeshift research facilities studying alien technology. The BLU base has been put under quarantine while the RED base is heavily damaged from crashed UFOs. Small alien pods are scattered throughout the map, which can be shot at to explode (similar to Pumpkin Bombs on Halloween event maps). Byre (Arena) - Added on October 6, 2015 (Invasion Update). Set in a farmland scattered with unfinished barns, Byre features a death ray in the middle that attacks a UFO at the end of each round. The map is unique in that there are two control points that must be captured (instead of one) and both control points are unlocked in the beginning of the round. Probed (KOTH) - Added on October 6, 2015 (Invasion Update). Set in a farmland (at night) being invaded by aliens, this map features static alien drones (that are spawned in at regular intervals) that can be shot at to explode (similar to Pumpkin Bombs on Halloween event maps). Also at regular intervals, a large UFO appears above the control point and begins abducting players near it. Players in the UFO gain a temporary mini-crit buff, but begin to slowly lose health from suffocation (until they reach their team's teleporters at the other side of the ship, teleporting them back into the battlefield with full health). Watergate - Added on October 6, 2015 (Invasion Update), Watergate (set in a sea-side port) is the only official map using the Player Destruction (PD) game mode, as players must collect bottles of beer from dead players and deposit them into a small UFO regularly flying around the center of the map (so that its pilots become drunk and crash into the mothership outside the battlefield). All players spawn with one bottle each (and cannot deposit their own bottle) and drop all of their collected bottles either manually, by running into a respawn area, or on death (also causing them to drop their own bottle). The non-Spy player with the most bottles on each team becomes the team's "leader", which allows them to dispense health and ammo to nearby teammates at the cost of having an outline marking their location (for both teams) through walls. Highpass (KOTH) - Added on December 17, 2015 (Tough Break Update). Landfall (CTF) - Added on December 17, 2015 (Tough Break Update). Snowycoast (PL) - Added on December 17, 2015 (Tough Break Update). Vanguard (CP) - Added on December 17, 2015 (Tough Break Update). Metalworks (CP) - Added on July 7, 2016 (Meet Your Maker Update). Sunshine (CP) - Added on July 7, 2016 (Meet Your Maker Update). Swiftwater (CP) - Added on July 7, 2016 (Meet Your Maker Update). Banana Bay (PLR) - Added on October 20, 2017 (Jungle Inferno Update). Brazil (KOTH) - Added on October 20, 2017 (Jungle Inferno Update). Enclosure (PL) - Added on October 20, 2017 (Jungle Inferno Update). Lazarus (KOTH) - Added on October 20, 2017 (Jungle Inferno Update). Mossrock (CP) - Added on October 20, 2017 (Jungle Inferno Update). Coal Town - Released in the Mann vs. Machine Update. An old desert mining town (and museum). A special event version of the map, named "Ghost Town", was released on October 26, 2012 and added one mission (Caliginous Caper) in a new difficulty (Nightmare). A test of endurance, this version of the map is one very long wave ("Wave 666") with zombies instead of robots and a timed respawn on the bomb. Decoy - Released in the Mann vs. Machine Update. An abandoned desert town (crudely altered as a decoy Mann Co. facility). The Mecha Update added one new Advanced mission, featuring Engineer robots. Mannworks - Released in the Mann vs. Machine Update. An alpine facility. Bigrock - Released in the Mecha Update. Longer than the original three maps, Bigrock is a desert-based facility (with the robots spawning in a large cave) that makes first use of the Engineer robot. Mannhattan - Released in the Two Cities Update. Taking place in an industrial area of a metropolis, Manhattan features two "gates" that serve as secondary objectives for the robots. Special "gatebots" (with glowing yellow lights on their heads) ignore the bomb and instead attempt to capture the gates. Once a gate is opened, all robots are temporarily stunned and their new spawn area is through the gate (complete with an additional bomb) for the rest of the wave. Tanks do not spawn in this map. Rottenburg - Released in the Two Cities Update. An old-fashioned German-style town with a large barricade at the front of the main tunnel. While the barricade is not destroyed (from being run over by tanks), bots must travel a longer path around. Team Fortress 2 features special yearly events for the holiday of Halloween. During the few weeks around October 31, health pickups are holiday-themed, players can wear unique holiday-restricted cosmetics (mostly resembling Halloween costumes), and performing a standard taunt has a random chance of performing a unique taunt (known as the Thriller, resembling the Michael Jackson music video of the same name). These effects can also occur whenever somebody has activated the Enchantment: Eternaween tool, a server has forced Halloween Mode, or during a real-life Full Moon. All of these maps (based on other released maps, usually with a spooky night theme) have unique features, ranging from special effects to boss encounters. Killing an enemy in these maps has a random chance of dropping a Candy Bag pickup (resembling hollowed-out pumpkins) that gives ammo and a short-timed crit boost. All maps also have explosive Pumpkin Bombs scattered around as environmental hazards (which must be shot at to detonate). Harvest Event (KOTH, Harvest) - Added on October 29, 2009. Along with introducing the event (and its standard features), the map includes a special NPC: the Ghost of Zepheniah Mann. Sporting his personal Ghastly Gibus, Zepheniah appears in certain spots in the map at brief times and stuns nearby players (by scaring them). Mann Manor (A&D, Mountain Lab) - Added on October 27, 2010. This event introduces co-operative boss encounters to the game, requiring all players to take them down. The boss for Mann Manor is the Horseless Headless Horsemann, a hulking giant (with a mutated Jack-O-Lantern for a head) that attacks with his powerful melee weapon (the Headtaker, capable of killing with a single blow). The Horsemann designates a random target as "It" and will constantly pursue that player until they die, survive for 30 seconds, reach their respawn room, or hit an enemy player with their melee weapon. The Horsemann can also perform a taunt if he is not pursuing a target, stunning all nearby players. Eyeaduct (KOTH, Viaduct) - Added on October 27, 2011. A giant eye (resembling the Demoman's missing eye) known as MONOCULUS appears as the map's co-operative boss encounter. Firing powerful eye-shaped projectiles (resembling the Soldier's rockets), the MONOCULUS can become enraged through being damaged (increasing its rate-of-fire and projectile speed). It can also teleport, leaving behind a purple vortex that takes nearby players to a special area (the Underworld). The Underworld is a set of islands that continously damages players, requiring them to find a glowing white portal at the far end. Leaving the Underworld gives players a temporary buff against both enemy players and MONOCULUS. When its defeated, it leaves behind a floating book (the Bombinomicon) that transports nearby players to another special area (Loot Island) for a final buff. Also, when capturing the point, Ghosts appear in some areas (disappearing after scaring a player). Ghost Fort (KOTH, Lakeside) - Added on October 26, 2012. Along with a seven-minute countdown timer (instead of three), Ghost Fort features a "Wheel of Fate" (which spins once the capture point is controlled, giving a random effect to all players). At certain points, evil wizard Merasmus appears as a co-operative boss encounter. While fighting him, two players gain a bomb for a head and must run into Merasmus to stun him. Defeating him opens up a temporary portal to a previously unreachable area, Skull Island, which grants a temporary buff. Helltower (PLR, Hightower) - Added on October 29, 2013. Both teams' bomb carts are replaced by carts of gravel containing the corpse of their opposing team's employer (Redmond and Blutarch Mann) and must be pushed towards the goal (in order to send them to Hell). Once the goal is reached, all players are also sent to Hell for a quick Arena round to determine the winner. During the Hell round, the team that won the Payload Race portion received a significant overheal, and the first team to reach the Spellbook in Skull Island wins the round. Players who die in Hell are turned into harmless Ghosts (unable to stun players). Carnival of Carnage (SD, Doomsday) - Added on October 29, 2014. Set in a twisted circus (overlooked by Merasmus), the mercenaries must appease the evil circus god Bonzo by delivering a suitcase filled with tickets to The World's Largest Strongmann Machine. At certain times, Merasmus may summon all players to the machine to put one of three temporary Curses on them (covering the entire map in Jarate, giving all players big floaty heads, and shrinking all players while removing their ranged weapons). Once the round ends, all players are thrown in one of three bumper car arenas, each with their own objective (from ramming a giant beach ball to the opponent's goal, to collecting rubber ducks, to try to be the last team remaining on a shrinking platform). Players who fall of the map in the bumper car round become harmless Ghosts and can only revive themselves by bumping into a living teammate. Gorge Event (A&D, Gorge), Hellstone (PL, community map Millstone), Moonshine Event (KOTH, community map Moonshine), Sinshine (CP, community map Sunshine) - Added on October 28, 2015, all four maps were developed by the community. Some maps include special features from previous event maps: Hellstone features encounters of Ghosts, Skeletons, the Horseless Headless Horsemann, and MONOCULUS (none of which pause the objective) and Moonshine Event features the "Wheel of Fate". Hellstone is also unique in that its cart is a ghost riding a minecart (which scares nearby RED players). Brimstone (PL, community map Fifthcurve), Maple Ridge Event (KOTH, community map Maple Ridge), Pit of Death (PD) - Added on October 21, 2016, all three maps were developed by the community. Pit of Death is unique for being the first map that's developed solely for the Halloween event (rather than a modification of a previous map). Cauldron (KOTH, community map Bagel), Cursed Cove (PD), Gravestone (PL, community map Rumble), Monster Bash (PD), Slasher (KOTH) - Added on October 19, 2018, all five maps were developed by the community. 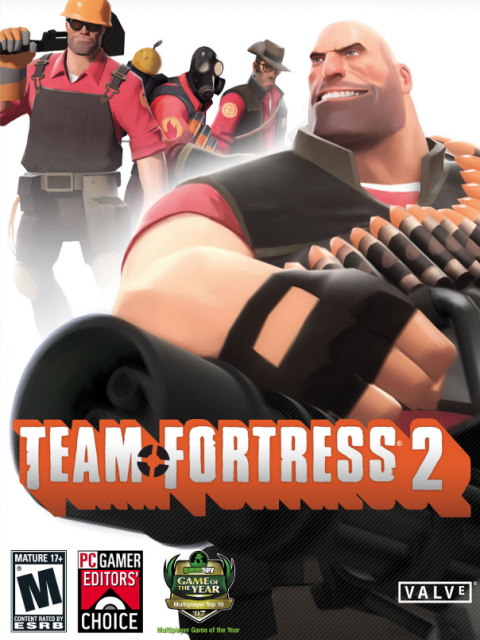 Throughout the years, Valve has added over one thousand items to the Steam version of Team Fortress 2, including additional weapons (both cosmetic re-skins and gameplay-changing alternatives), cosmetic items, "Action" items (special effects that are manually activated in-game), and special Tools (for use in the Backpack interface). Most of these items can be acquired in numerous ways (from random "drops" to community market purchases) and are kept as separate entries in the player's "Backpack" (a personal inventory system unique to each player). Some items are rare and unobtainable, given only to certain players (during a special event or tournament). An index of all items can be found in the in-game "Mann Co. Catalog" section. After the introduction of the "free-to-play" system, player accounts are now separated into Free and Premium accounts. Players who purchased the game prior to the update immediately receive Premium accounts, and Free accounts can be made into Premium accounts through either a purchase from the in-game store or the activation of a special Tool (Upgrade to Premium Gift) given by another player. Free accounts have less starting Backpack storage, no way to randomly obtain (or craft) cosmetic items, and restrictions on both trading (cannot send items that they find, with the exception of Tools) and gifting (cannot send gift-wrapped items). The Backpack screen, showing the Stock wepaons. Each player has their own unique "Backpack", which stores all the items in possession of the player, with each item in their own unique slot. Items can be viewed, moved around, customized, activated (tools only), equipped, and deleted from within the Backpack screen. Each "page" in the Backpack screen holds 50 items (in a 10x5 grid). Players start with six pages worth (for a total of 300 item slots) and can use the one-use "Backpack Expander" Tool to gain two additional pages. Multiple Backpack Expander Tools can be used to give the player up to 40 pages total (2000 item slots). Players with Free accounts only start with one page worth (for a total of 50 item slots) and are given five more pages once they are made Premium. In addition, the Backpack screen can show a separate "page" listing all Stock weapons (default weapons provided to all players). Using certain tools (including the Name Tag, Description Tag, Strangifier, and Killstreak Kit) on Stock weapons gives the player an additional weapon of that type (with the changes applied and item quality changed). The default Loadout screen for a Soldier. Does not show Taunts. Each player has four separate loadouts for each of the nine playable classes (for a total of 36 loadouts), allowing them to equip different weapons and cosmetic items and change them quickly before leaving the spawn area. One Primary Weapon slot. (Changed to the Secondary Weapon slot for the Spy). One Secondary Weapon slot. (Changed to the Melee Weapon slot for the Spy). One Melee Weapon slot. (Changed to the Invisibility Watch slot for the Spy). One PDA slot. (Shown only for the Engineer's Construction PDA and Spy's Sapper). In addition, players with additional Taunt Items can equip them for each loadout. Up to eight additional Taunts can be equipped at a time, each numbered slot corresponding to the key used in the Taunt menu. An item of Genuine quality, earned by pre-ordering Don't Starve. Items in the Backpack are assigned a quality, designating their rarity and appeal. Quality is conveyed in game by the color of an item's name and have no added gameplay advantages. Items also have a level assigned to them (which affects nothing), an item type describing the item (sometimes prefixed with either Limited or Strange, depending on quality), and a special name prefix (with the exception of Normal and Unique items), Most of the items found in-game are in the Unique (yellow) quality. Normal (gray) items are the stock weapons provided to every player by default. They do not count towards the normal Backpack slots, have no unique name prefix, and cannot be modified, traded, gifted, sold, or deleted. Any modification Tool used on a Normal weapon give the player a new drop of the same weapon in the Unique quality. Unique (yellow) items are the "default" quality for items that are found, crafted, rewarded, and purchased (through the in-game store). They have no unique name prefix and non-limited ones can not be sold in the community marketplace. Using the Strangifier Tool on specific Unique items changes it to the Strange quality. Strange (orange-brown) items are special versions of Unique and Normal items, allowing the player to track a certain statistic (usually the amount of kills for a weapon and the amount of points scored for a cosmetic item) achieved using the item. Usually found by unlocking crates, they can also be found by completing "Tours of Duty" in Mann vs. Machine mode and can be obtained by using a special Tool (the Strangifier) on certain Unique items. Special Tools (known as Strange Parts, also found in crates) can be applied to track more statistics (such as specific types of kills). "Strangified" items originating from non-Unique and non-Normal items retain their original item quality (with the added benefits of Strange items). Strange items also have an evolving name prefix (that changes as the player gains more of their primary statistic) and can be traded or sold in the community marketplace (resetting their statistics back to zero). Decorated items are special versions of Normal items found through both Contracts and special Contract Cases (unlocked similarly to normal Crates). Like the weapon skin system used in Counter-Strike: Global Offensive, decorated items have a special exterior pattern (or "skin") applied to them, each with their own unique wear-and-tear (such as blood splatches and scratches showing the the underlying weapon) based on their skin "quality" (from the flawless Factory-New to the extremely worn Battle-Scarred). This quality has no color assigned (and is shown as white in the Steam inventory system) and is instead assigned a weapon grade based on the rarity of the item (from the light blue Civilian Grade to the light red Elite Grade). Unusual (purple) items are rarer versions of cosmetic items and alternate taunts found only by unlocking crates (with a 1% chance per crate). Each Unusual item has a special particle effect to distinguish it in the battlefield. Due to their rarity, they can be sold in the community marketplace (usually for a high price). One other weapon has the Unusual quality, despite not being found in a crate and not having a special particle effect: the Horseless Headless Horsemann's Headtaker. Collector's (red) items are rarer versions of Unique items, crafted by using a special Tool (the Chemistry Set, rarely dropped in the in-game drop system) and requiring 200 copies of the same Unique-quality weapon. Due to their rarity, they can be sold in the community marketplace (usually for a high price). Community (light green) items are given (very rarely) to specific players who have made contributions to the game itself or the Team Fortress 2 communities. They have a unique particle effect (the "Community Sparkle") and special descriptions. Some of the weapons have a glossier appearance. Community-created items included in-game are given to their creators with a unique "Self-Made" name prefix and description. Items in these qualities are limited-edition designed to increase their appeal and can not be obtained through the drop system, by crafting, or by purchasing in the in-game store. Unlike their non-limited, non-modified Unique counterparts, the items in these qualities can be sold through the community marketplace. Some items in the Unique quality (notably those released in special events) are also limited-edition (as noted with the "Limited" text in the weapon type) and can be sold in the community marketplace. Vintage (blue) items are special versions of earlier Unique items that were converted automatically. Used originally to designate items obtained before the introduction of the in-game shop, it has also been used in some rare cases (such as designating some items crafted using expensive recipes prior to them being less expensive). Genuine (dark green) items are special versions of promotional items that were awarded to players who pre-ordered or purchased specific games within a specified time window. They were also obtained through purchasing specific merchandise and participating in specific tournaments and special events (in which the item can not be traded or sold). Haunted (green-cyan) items are rarer versions of most Halloween-themed cosmetic items (and the Bat Outta Hell weapon). Strange items are unique in that their name prefix (unless renamed using the Name Tag Tool) changes as the gain more of their primary statistic while using the item (usually Kills for most weapons). Increasing in "rank" will also announce this fact to the server. While these items can also be found by other means, some other items can only be found by completing specific achievements (such as dominating a player with the Ghastly/Ghostly Gibus or Pyrovision Goggles to earn their own). All items earned through achievements are in Unique quality and can not be traded (although early releases allowed this) or sold in the community marketplace. Starting with the Sniper vs. Spy update, players can receive basic Unique items (including duplicates) for free by simply playing the game. Every player, no matter how long they have been playing the game (or their skill level), have an equal chance of receiving weapons throughout each week (as long as they are actively playing in VAC-secured servers). Players earn one random weapon every 30-70 minutes up to a limited amount per week (roughly 10-12 weapons, more for people who have not played in over a week). Weeks start every Thursday morning. Players can rarely find cosmetic items and Tools (such as Name Tags) through random drops (as long as they have a Premium account). However, these drops (along with Crates, which are slightly more common) use a different time frame. Prior to April 20, 2010, the random drop system was different in that instead of rolling to determine when the player's next drop is, it rolls randomly at certain intervals to determine if the player receives a drop. This change was in response to both unlucky streaks (in that players can have long periods of no drops) and a idling (a method of "gaming" the random drop system by connecting to a server and doing something else). Weapons and cosmetic items found through this system can not be sold in the community marketplace. Smelting two weapons used by the same class to create Scrap Metal, then combining three of those to make Reclaimed Metal, then combining three of those to make Refined Metal. These Metals are used in most crafting recipes and is one of the base currencies of the community "economy". Combining three weapons used by the same class to create Class Tokens, then combining three weapons used in the same weapon slot to create Slot Tokens, then combining those with one Scrap Metal to create a random weapon for that class and slot. This is used to attempt to craft a weapon that's not available as a random drop (or in an attempt to receive a new weapon early for free). Combining three Refined Metals (or two cosmetic items) to craft a random cosmetic item. Four Refined Metals and one Class Token can be used to craft a random cosmetic item for that specific class. Added in the Mann-conomy update, players can trade their items to other players. Originally an in-game system, introduction of Steam Trading allowed players to trade other virtual items in their Steam inventory (including games and items from other games, such as Dota 2 and Counter-Strike: Global Offensive). When in a trade, players are taken to the trading screen showing the contents of their backpack. Players can use the provided text chat box to negotiate. Players then pick the items they want to trade and check off a box to signal that they're ready. Items can be gifted by one player picking the items to be gifted and the other player checking the ready box with no items selected. In short time after the update, the Team Fortress 2 community gained a new player-based "economy" with Refined Metal as its base currency. Due to the rarity of limited-edition items and cosmetic items of Unusual quality, the economy would evolve to use Mann Co. Supply Crate Keys as currency (purchasable through the Mann Co. Store as both a way to earn Unusual cosmetic items and a "real world" indicator). Players can also use the Gift Wrap Tool (introduced in the Scream Fortress Update) to deliver items to other players (including some items that are normally untradable). When unwrapped, the gifted items have a bonus description showing who sent the gift and the time unwrapped. Also introduced in the Mann-conomy Update is the Mann Co. Store, which lets players purchase various items with real money (including money from the Steam Wallet). Along with most weapons and cosmetic items normally found in random drops or crafting, players can purchase unique Tools, bundles, and other special items. Players with Free accounts could also upgrade to Premium accounts with any purchase. Outside of the community marketplace, the Mann Co. Store is the only way to get all variations of the Mann Co. Supply Crate Keys (which is commonly used to unlock Crates and earn special items). Along with previewing cosmetic items on base class models, players can also "try out" any weapon (provided they aren't "New" to the store) for one week, temporarily adding the weapon to the player's inventory. Portions of purchases of community-contributed items go towards the creators of those items. Players can also purchase "Map Stamps" to contribute to the authors of community maps (which give a special effect to a certain cosmetic item when the map is played). Each update is usually accompanied by a descriptive (and often comical) series of web pages detailing what's new in the game. Since the game's initial release, Valve has made numerous updates to the PC version, adding a wide variety of new features, gameplay mechanics, UI improvements, and content. Players who want to experience the original unpatched version of the game can only officially play it on the version included in the console Orange Box releases. The major updates are usually accompanied by a series of web pages on their main site that details all the important changes that the update makes. These pages are usually comical, feature either a special comic or animated short, and detail most of the game's backstory and secondary characters (including Saxton Hale and the Mann family). Gold Rush Update - Added the game's first post-launch gamemode (Payload) accompanied with a new map for that mode (Gold Rush). It also added a weapon inventory system, where new alternate weapons can be unlocked by earning achievements. Three unlockable weapons were added for the Medic: the Blutsauger, the Kritzkrieg, and the Ubersaw. The Pyro Update - Added the game's first community-made maps to be included with the game (Fastlane and Turbine) and three unlockable weapons for the Pyro: the Flare Gun, the Backburner, and the Axtinguisher. It also added a new ability for the Pyro: the Airblast. A Heavy Update - Added a new game mode (Arena) accompanied with new maps for the mode (Lumberyard and Ravine, as well as revisions of Granary and Badlands). It also added two new maps (Steel and Badwater Basin) and three unlockable weapons for the Heavy: the Sandvich, Natascha, and the Killing Gloves of Boxing. The Scout Update - Added three new community maps (Egypt, Junction, and Watchtower) and three unlockable weapons for the Scout: the Sandman, the Force-a-Nature, and Bonk! Atomic Punch. It also updated numerous aspects of the Spy to make him easier to use (such as a faster backstab animation and a new ability to change his shown weapon while disguised). The Sniper vs. Spy Update - Initially billed as the Sniper update, Valve started slipping hints into the website to show the Spy's inclusion. Added a new system for unlocking weapons (the "random drop" system), a new game mode (Payload Race) accompanied by a new map for that mode (Pipeline), three new maps (Hoodoo, Nucleus, and Sawmill), three unlockable weapons for the Sniper (the Razorback, the Huntsman, and Jarate), and the Spy (Dead Ringer, Cloak and Dagger, and the Ambassador). The First Ever Classless Update - The first major update to not focus on a particular class, this update adds a new game mode (King of the Hill) accompanied with new maps for that mode (Viaduct, as well as revisions for Nucleus and Sawmill), new maps (Offblast, Yukon, and the CTF version of Sawmill), new effects and animations, and 21 unlockable cosmetic headgear (including "hatless" variants of the Scout, Engineer, and Sniper). The Terrifying Haunted Halowe'en Special - Unique Halloween event that lasted between October 29 and November 2. Added two new King of the Hill map (Harvest and Harvest Event) and five 'scarechievements' which unlocked Halloween-based hats. WAR! Update - Added two new maps (Doublecross and Gorge) and a new system for unlocking weapons and cosmetics (the "crafting" system). It also added three unlockable weapons for the Soldier (the Direct Hit, the Equalizer, and the Buff Banner) and the Demoman (the Eyelander, the Chargin' Targe, and the Scottish Resistance). This update also had a limited-time contest that pitted both classes together, with the victor (the Soldier) receiving a new item: the Gunboats. 119th Update - Commemorates the game's 119th update with the release of a Heavy figurine for sale and four cosmetic items showing when the player has started playing the game: the Primeval Warrior (platinum, played since the pre-launch beta), Grizzled Veteran (gold, 0-3 months after release), Soldier of Fortune (silver, 3 months to 1 year after release), and Weekend Warrior (bronze, beyond 1 year after release). The Primeval Warrior was added post-update while the Weekend Warrior was renamed to Mercenary. The Mac Update - Added support for Mac platforms (giving the Earbuds cosmetic to users who played the game on Mac in the first few days) while simplifying the menus and adding new offline modes (Practice Mode and Training Mode). The Engineer Update - Added new maps (Coldfront, Hightower, Thunder Mountain, and Upward) and four unlockable weapons for the Engineer (the Frontier Justice, the Wrangler, the Southern Hospitality, and the Gunslinger). Also added a limited-release item: the Golden Wrench. The Mann-Conomy Update - Added two new systems for obtaining weapons and cosmetics (the microtransaction-based Mann Co. store and item trading), an item customization system (using items bought in the store), item sets that give bonuses when equipped, and numerous weapons: the Shortstop, Mad Milk, and Holy Mackeral for the Scout, the Black Box, Battalion's Backup, and Rocket Jumper for the Soldier, the Degreaser and Powerjack for the Pyro, the Gloves of Running Urgently for the Heavy, the Vita-Saw for the Medic, the Sydney Sleeper, Darwin's Danger Shield, and Bushwacka for the Sniper, and the L'Etranger and Your Eternal Reward for the Spy. The Second Annu-Hell Scream Fortress Hauntdead Halloween Special - Unique Halloween event. Added two new Attack/Defend maps (Mountain Lab and Mann Manor), the ability to gift-wrap items using an item bought in the store, and the game's first boss NPC (the Horseless Headless Horsemann). It also added the Sticky Jumper training weapon for the Demoman. Australian Christmas - Added time-locked holiday-themed crates (requiring a special "Festive Holiday Key" that is bought from the store), as well as a new one-time game mode (Medieval Mode, for use with the new DeGroot Keep map), an option to support community mapmakers (by buying "map stamps" from the in-game store), 20 new hats, new item sets, and a variety of new weapons: the Boston Basher and Candy Cane for the Scout, the Back Scratcher for the Pyro, the Loch-n-Load, Ullapool Caber, and Claidheamohmor for the Demoman, the Brass Beast, Buffalo Steak Sandvich and Warrior's Spirit for the Heavy, the Jag for the Engineer, and the Crusader's Crossbow and Amputator for the Medic. The Hatless Update - Added a Coaching mechanic (which allowed experienced players to coach less-experienced players), an updated Training Mode, numerous UI and behind-the-scenes changes, and a new map revision (the King of the Hill version of Badlands). The Replay Update - Added a feature for recording and saving replays, as well as the ability to edit and save them as video clips (with in-game YouTube upload support). Also added the ability to equip alternate taunts (with the first one, the "Director's Vision", as an achievement unlockable), special numbers for crafted headgear, and new cosmetic items. The Über Update - Made the game free-to-play. Also added a new Payload map (Barnblitz) and a variety of new weapons: the Soda Popper, Atomizer, and Winger for the Scout, the Mantreads, Disciplinary Action, Liberty Launcher, Reserve Shooter, and Market Gardener for the Soldier, the Detonator for the Pyro, the Splendid Screen, Persian Persuader, and Ali Baba's Wee Booties for the Demoman, the Tomislav, Family Business, and Eviction Notice for the Heavy, the Overdose, Quick Fix, and Solemn Vow for the Medic, the Bazaar Bargain and Shahanshah for the Sniper, and the Enforcer and Big Earner for the Spy). Mann Co. One Year Manniversary Update - Added a community-rated database of user-submitted weapons (the Steam Workshop), customizable loadout presets, a second miscellaneous loadout slot, numerous cosmetic items, a new community map (Gullywash), and the introduction of taunts that require more than one player. The Third Annual Scream Fortress Very Scary Halloween Special - Unique Halloween event. Added a new King of the Hill map (Eyeaduct) with a new boss NPC (Monoculus). It also added Halloween-themed costume item sets for each class, some of which add special effects to the player when equipped. Australian Christmas (2011) - Added two time-locked holiday-themed crates, numerous community-made weapons and cosmetics, a new map revision (the Control Point version of Foundry), and new weapons for the Engineer (the Pomson 6000 and Eureka Effect) and Pyro (the Third Degree, Phlogistinator, and Manmelter). Pyromania - Added a new one-time game mode (Special Delivery, for use with the new Doomsday map) and "Pyrovision": a special lens that allows the player to see the world as the cutesy and childlike "Pyroland". It also adds a variety of new weapons, including the Pretty Boy's Pocket Pistol and Baby Face's Blaster for the Scout, the Beggar's Bazooka and Escape Plan for the Soldier, the Scorch Shot, Rainblower, and Lollichop for the Pyro, and the Cleaner's Carbine and Hitman's Heatmaker for the Sniper. Mann vs. Machine - Added a co-operative mode (known as Mann vs. Machine), where up to six players face off against waves of robotic facsimiles of the normal classes and earn currency to upgrade their weapons and abilities for the match. Also adds a special pay-to-play mode (Mann-Up Mode) to earn rare loot when completing multiple Mann vs. Machine matches. Scream Fortress: The Fourth Annual Spectral Halloween Special - Unique Halloween event. Added a new King of the Hill map (Ghost Fort) with a new boss NPC (Merasmus). Also added a special Mann vs. Machine mission with zombie facsimiles instead of robots. Mecha Update - Added a new Mann vs. Machine map (Big Rock) and missions featuring a new enemy (the Mecha-Engineer, who can aids its allies with teleporters). Also adds the two time-locked holiday-themed crates from Australian Christmas (2011) and three new weapons: the Loose Cannon for the Demoman, the Rescue Ranger for the Engineer, and the Vaccinator for the Medic. Linux Update - Added support for Linux platforms (giving the Tux Penguin cosmetic to users who played the game on Linux in the first few days). Robotic Boogaloo - The first update featuring only community-created content. Features 57 robot-themed re-imaginings of classic cosmetic items. Summer Event 2013 - Added two new maps (Process and Standin), numerous fixes and balance changes, and 64 community-made items. The Scream Fortress 5th Annual Helloween Special - Unique Halloween event. Added a new Payload Race map (Helltower). Also added a new "magical spell" system, where players with special cosmetic "spellbook" items equipped can pick up special one-use magical spells in Halloween maps to perform special abilities. Also added over 100 community-created halloween-themed items. The Two Cities Update - Added a new Control Point map (Snakewater) and two new Mann vs. Machine maps (Mannhattan and Rottenburg). Also added new Mann vs. Machine upgrades, including upgraded rockets for the Soldier and both a projectile shield and resurrection ability for the Medic. Added the ability to completely refund in Mann vs. Machine. Love & War Update - Corresponding with the Expiration Date video short, this update added a variety of new partner taunts, crafting recipes (for unique "bread-based" weaponry), and a variety of new weapons (including the Back Scatter for the Scout, the Air Strike for the Soldier, the Tide Turner for the Demoman, the Classic for the Sniper, and the B.A.S.E. Jumper for both the Soldier and Demoman). Scream Fortress: The Sixth Annual Halloween Special - Unique Halloween event. Added a new Special Delivery map (Carnival of Carnage). Also added numerous community-created halloween-themed items. End of the Line - Corresponding with the End of the Line community video short, this update added numerous community-made cosmetic items (and some weapons) with the short's theme. Smissmas 2014 - Added two time-locked holiday-themed crates featuring either festive-themed weapons or community-created cosmetic items, a new beta game mode (Mannpower), and three new weapons: the Iron Bomber and Quickiebomb Launcher for the Demoman, and the Panic Attack shotgun. The Gun Mettle Update - Added a new pay-to-play contract system, where players can earn special decorated versions of standard weapons. It also added the first official three-point Capture Point map (Powerhouse) and four community-created maps (Borneo, Snowplow, and Suijin). Hats are a popular collectible item in Team Fortress 2. They range in popularity and rarity, and the number of hats in the game has been increasing in recent updates due to the involvement of the Team Fortress 2 community. Below is a list of all the hats in Team Fortress 2 that can be equipped by any class. The page for each class has a complete list of class-specific items: Scout, Soldier, Pyro, Demoman, Heavy, Engineer, Medic, Sniper, Spy. Miscellaneous items fit in cosmetic slots on the loadout screen, just like hats. Below is a list of all the miscellaneous items in Team Fortress 2 that can be equipped by any class. The page for each class has a complete list of class-specific items: Scout, Soldier, Pyro, Demoman, Heavy, Engineer, Medic, Sniper, Spy. The original graphical style shows just how much changed during development. Valve seems to have a penchant for agonizingly lengthy development cycles; the gap between the first two Half-life games was 6 years. According to Valve staff in the game's commentary, TF2's delays were the product of ideas that failed after significant time had been invested in them. The clean-cut spy movie look of the released product was not even a notion in the early stages of this game's R&D. The first screenshots make TF2 look like an attempt at a realistic modern combat simulator. This was the initial intent, but this idea was scrapped in favour of a more light hearted style way late as far as most developers would be concerned. The Valve team have also spent a huge amount of time looking into a shooter that incorporated a commander for each team who had some form of overlord viewing angle and the ability to give players on the ground information and orders. The idea was tested and redesigned countless times, but there was no way to guarantee that both the commander and the fighters would both have fun in any given game; the possibility of a poor commander or lousy squad members messing up the whole experience weighed too heavily on Valve and, after all the invested time, they abandoned the idea completely. There were many other detours on the way to making TF2 the game it is today, and Valve has a blog open that sort of regularly posts messages about such things as well as in-progress update news. Early concept art for the Demoman. The art style in Team Fortress 2 was drastically changed from that of the original, which strove for the appearance of military realism. By contrast, TF2 has a comical, cartoon-like appearance, with characters having deliberately humorous taunts and exaggerated animations. Ever wondered what The Incredibles would look like as a class-based first-person shooter? TF2 is your answer. Valve constructed the models and architecture of TF2 using the Source Engine, their in-house development platform and graphics engine, but made several major modifications to the shader system along the way. The reflections in Team Fortress 2 all have a more rubbery look to them, even on the characters. This causes models to have more defined silhouettes even in darker locations, an effect intended to improve the readability of other players during combat. The classes themselves were built explicitly to be identifiable and easy to recognize immediately at any distance to prevent confusion; this has contributed considerably to the ubiquity of the game's characters in internet chat rooms as well as encouraged the Valve team to make a number of "Meet the Team" videos starring the individual characters. The individual classes now, as a result, have personalities and characteristics that are fleshed out to a degree never attained by a multiplayer shooter. Despite the cartoonish feel the game displays, this should not be interpreted to mean technical laxity; the "Meet the Team" videos are all done with the in-game engine and speak for themselves if you need convincing on this point. With the release of the Engineer Update on July 8, 2010 one hundred " Golden Wrenches" were randomly handed out to players to replace their Engineer's regular wrench. Shortly after this event one of the lucky few to receive a Golden Wrenche realised that he may not even be lucky: Jon "WiNGSPANTT" Tran of TopTierTactics.com decided to destroy his specimen as it seems to him that it is cursed. In his words it has "served as a source of constant inquiry, hate, jealousy, and unwanted negative attention." Wanting to get something good out of this, WiNGSPANTT opened a small donation platform favouring the Child's Play Charity. Along with him, 7 other Golden Wrench owners stepped up do destroy their item as well. For every 25 donations of $10 or more, the identity of one of those 7 would be revealed. Needless to say that mark has been overstepped. The wrenches were destroyed on August 31, 2010. Which resulted in a "worldwide" notice to every TF2 player currently playing on a server, just as when a Golden Wrench was found during the 3 days of the Engineer update.